Tens of thousands of people flocked to Sen. Bernie Sanders' West Coast events over the weekend - his campaign boasted a record-setting crowd of 28,000 people in Portland, Oregon Sunday. A day earlier, they said 15,000 people showed up to hear him speak in Seattle. The independent Vermont senator, who is running for the 2016 Democratic nomination, has drawn fans across the country with his message focused on income inequality and taking on Wall Street. 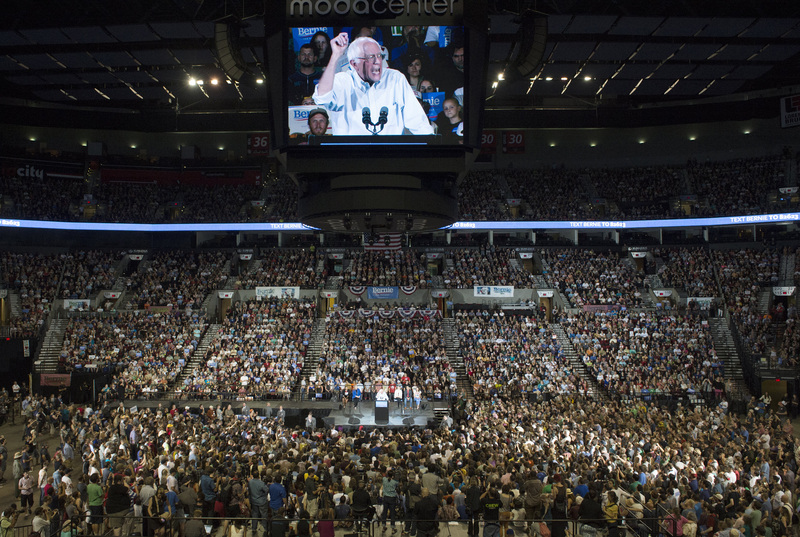 "All across this country people are sick and tired of establishment politics, establishment economics and they want real change," he said in Seattle. "The people of America understand that corporate greed is destroying our country." But he has also become a target for Black Lives Matter activists. They forced him off the stage at another Seattle-area rally that day, and he was also interrupted by protesters during the Netroots Nation gathering of liberal activists last month. And Sanders' big crowds haven't forced the Democratic frontrunner into dangerous poll territory yet. A CBS News poll released last week had Clinton with a wide lead in the Democratic contest for the nomination, receiving 58 percent of Democratic primary voters' support. Sanders was second with 17 percent. When asked which candidate would be their second choice for the nomination, voters also overwhelmingly opted for Vice President Joe Biden, who has not yet announced whether he is running. Forty-two percent said Biden was their second choice, compared to just 15 percent who chose Sanders. The gap is slightly narrower in early-state polls: A Quinnipiac survey last month found Clinton at 52 and Sanders at 33 in Iowa. And an NBC/Marist poll released earlier this month found Clinton at 42 and Sanders at 32 in New Hampshire. There is some concern about how self-proclaimed socialist Sanders would fare in the general election, with most voters assuming that Clinton would perform better. The latest Quinnipiac Poll has Clinton neck-and-neck with GOP challengers like Jeb Bush and Scott Walker in hypothetical matchups, but Sanders narrowly trails both Republicans. CBS News Political Reporter Jake Miller contributed to this story.